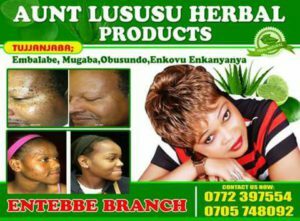 Buganda Road Chief Magistrate’s Court has charged renowned cosmetic dealer Fiona Namawejje, aka Aunt Lususu, over the illegal use of Uganda National Bureau of Standards (UNBS) Quality Mark. Namawejje, a resident of Boston Village in Makindye Division and a dealer in cosmetics products branded Aunt Lususu on Thursday appeared at Standards and Utilities Court Division of Buganda Road Court presided over by Grade One magistrate Gladys Kamasanyu. 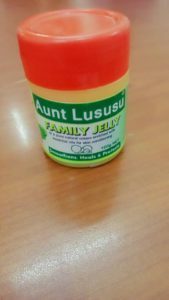 Prosecution alleges that Namawejje on September 14, 2017 at Aunt Lususu Shop no.404A, Nakasero Complex in Kampala District, applied UNBSQ-mark on her cosmetics products called Aunt Lususu Family Jelly, Aunt Lususu Face Clearing Jelly and Aunt Lususu Cosmetics for sale without a permit from UNBS. Court has ordered Aunt Lususu to pay a cash bail of Shs1 million and to deposit her original motor vehicle logbook before being granted bail. Her two sureties have also been ordered to sign a non-cash bond of Shs100 million each, deposit their original car logbooks before court, land titles and land agreements respectively. The case has been adjourned to February 19 for hearing, after prosecution from UNBS offices informed court that investigations into the matter are over. Namawejje was arrested yesterday days after UNBS seized 1.7 tonnes of assorted cosmetics items worth Shs300 million from Sure Deal Beauty Centre Limited on February 2. UNBS and police have since initiated legal proceedings against the Sure Deal Beauty Centre and its directors.